Water fascinates us. How else do you explain the price premium on beachfront, lakefront, and riverfront properties? As skydivers, water should fascinate us for another, very important reason–it moves and responds to physics much like air, only we can actually see and thereby learn from it. As such, water has a whole lot to teach us about airflow and, more importantly, turbulence. In the news recently, we find a very public example of the effects of turbulence from an Australian military skydiver who suffered severe injury following turbulence-induced canopy collapse while doing a demo jump into a stadium. Air turbulence is something most of us understand conceptually, but not so much in practice. Why? We can’t see it. And if we’re on the ground, it usually doesn’t even affect us that much unless winds are extreme, so we don’t think about it that much. But when you’re flying a parachute, turbulence can radically affect your parachute’s flight and change your life very quickly. A little turbulence might feel like driving over a bumpy road, but severe turbulence can partially or completely collapse your canopy. Canopy collapses can cause radical, diving turns and even put you back in freefall at an altitude where you absolutely never want to be in freefall! The good news is that turbulent airflow does follow the laws of physics, just like a river flowing around rocks. (Watch that closely next time you get a chance.) Thus, we usually have a pretty good idea of where it will appear when winds pick up. Turbulent airflow exists downwind of obstacles, extending to 10-20 TIMES the height of the obstacle horizontally! It also exists behind moving objects, and very much so behind airplanes with props turning, even if they are parked. Winds can also affect the location of turbulence generated by aircraft. Let’s put this into practice. For example, with our 34-foot-tall hangar at Skydive Spaceland Houston in a north wind, turbulence could be expected at distances of up to 340-680 feet to the south. Measuring directly south of the middle of the hangar’s edge, the runway is about 450 feet away. Thus, the entire area between the hangar and the runway would be considered a hazardous landing zone in a north wind. This is why you generally see even highly experienced jumpers landing east of the hangar in north winds; it’s just safer. Take another look at the turbulence graphic above with the airplane. Notice the turbulence behind the airplane? 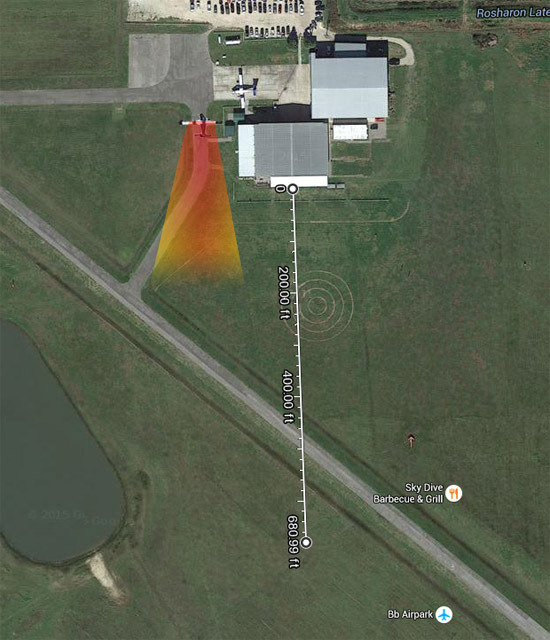 This is essentially the same situation we have at Spaceland Houston if an aircraft is turning hot and loading at loading area 2 just west of the hangar, facing north. Turbulence from this aircraft, especially but not only with a west wind, will affect the west-most edge of the staff/D-license landing area, making it a very good place to avoid no matter how many jumps you have or what kind of canopy you’re flying. The laws of physics do not bend for skydivers, no matter how many jumps they have! A good rule of thumb is to never land anywhere behind a running airplane or close to and facing an obstacle. A good rule of thumb is to never land anywhere behind a running airplane or close to and facing an obstacle. Just downwind of an obstacle, any significant wind will create turbulence right where you can least afford to deal with it–close to the ground where you have very little time and altitude to recover from a canopy collapse. Besides, if you overshoot while facing said obstacle, you might end up pulling a Wile E. Coyote faceplant on the obstacle, risking injury, embarrassment, and lots of beer owed. Turbulence is a potential factor on any skydive whether you’re landing on or off the DZ. Before you make a skydive, consider the likely areas of turbulence in today’s conditions and plan to avoid those areas. If you need a little help, take a look at the aerial cheat sheets we’ve put together to help you sort it out. Now to the really cool stuff: Here’s a video to help you visualize air turbulence using smoke, put together by our awesome staff members Ken Stone, Rosy Booker, Ben Nelson, and Nick Lott. As you watch this video, note the extreme change in both direction and speed of the wind when the smoke canister is placed downwind of obstacles. Now imagine what your canopy will do when flying through the same highly variable wind conditions. Do you really want to fly there? I absolutely don’t! Now here’s a video of what can happen to a canopy that does run afoul of turbulence. It’s a tandem, so it’s a lighter-loaded and lower-performance wing than what many skydivers fly. This result is quite ugly, and it could have been even more violent with a higher-performance wing. For more information and several first-hand stories about skydivers battling dust devils (which in a sense are just visible turbulence), see this article from Skydive Mag. Note that one of the big differences between a “dust devil” and “turbulence” is that you can see a dust devil coming as it has picked up dust. In grassy areas, turbulence is invisible unless it picks up something you can see being flung around. This is why an understanding of where turbulence develops, and avoidance of those areas, is your best defense. Concerning the turbulence accident video: can anyone comment or suggest what canopy control inputs the jumper could have made to recover? Hey Mike, thanks for asking! In typical turbulence, things just feel a little bumpy and airspeed is your friend, so hands all the way up for full flight. In this case though, a large part of the canopy collapsed with the nose down and in that scenario, typically a strong flare to keep the canopy overhead and try to repressurize it would be indicated. And of course, if the canopy is collapsed on one side like this, a turn will result and a stronger flare on the opposite side to counter would be indicated. Firstly, the bes thing is prevent a situation of this, How? analyzing the weather before jump, analyzing the area that you will use to land. But if you are in a situation of turbulence, the best thing that you can do is have your system (canopy, lines, harness) with more G forces, pressure in your canopy, tension in your lines can resist better the turbulence. If you have the ability to land with more speed, this can help. Hey Jose, absolutely! Staying down in sketchy conditions and/or choosing landing areas with low risk of turbulence is the best plan. Thank you for your comments!